In our last post, we tackled the topic of entertaining on your lawn this autumn season. With the handful of tips we offered, you may think that your fall lawn care is taken care of. Unfortunately, this is not true. There is a lot of work that goes into preparing your lawn for winter. 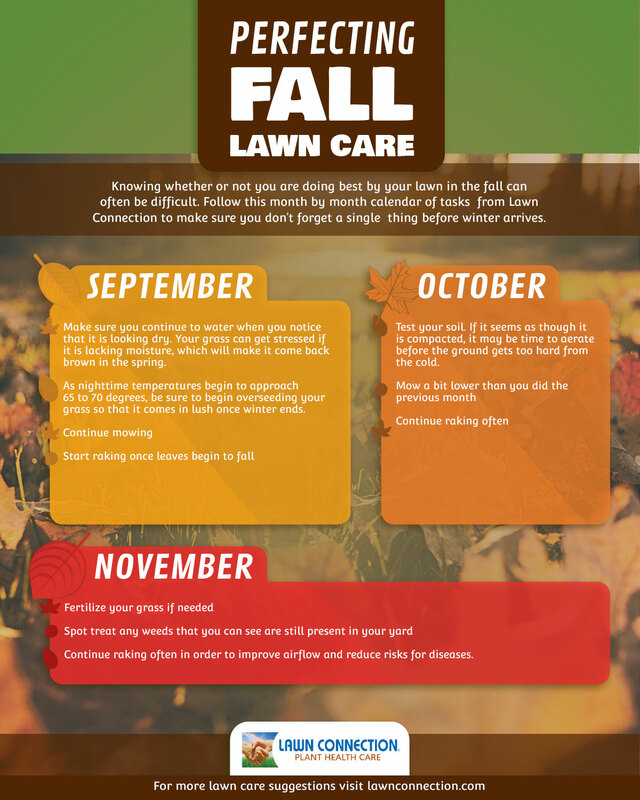 In order for you to get a better idea of how much you need to invest in your coming months, we have put together a list of eight essential fall lawn care tips so that you can be sure you have completed all of the tasks required to have a healthy lawn come spring. Continue reading below to learn more. It may be tempting to stop mowing once the temperatures start to drop, but this would not do your lawn any favors. Throughout September, be sure that you continue to mow as you normally would. Once October arrives, you can cut down the frequency you are mowing. On the other hand, lower your mower blade a bit so that your grass is shorter than it has been throughout the summer and the previous month. When November hits, you can likely stop mowing altogether. Just be sure that you don’t forget to winterize your mower. If we are getting a lot of rain in our area, you may not need to water your grass at all. However, it’s important that you keep a close eye on the moisture levels of your lawn. If it gets too dry before winter really sets in, you could be dooming your grass for the coming spring. Raking is extremely important at this time of the year. If you let leaves pile up in your lawn, you will be restricting the amount of air your grass is getting. This essentially suffocates your lawn. Additionally, letting leaves accumulate can lead to lawn disease which will destroy your turf before the warm weather returns. You may or may not need to aerate your lawn at the end of October or the beginning of November. Check to see how compacted your soil is once the temperatures are getting noticeably colder, but before the ground freezes. If it seems as though your grass could use a breather, then we would suggest that you aerate before it gets too chilly out. You’re going to want to apply a nitrogen-rich fertilizer if you want your lawn to be green and lush next year. This will give your lawn all of the nutrients required for it to get through the winter and grow back even stronger than it was when spring arrives. If there are bare spots in your lawn, you should absolutely apply seed to them before winter. If you do not, they will still be bare when the snow melts in April. Seeding can be a bit difficult on your own, however, so we would suggest that you hire a professional lawn care service to perform this task for you. You might think all of the pests are irrelevant now that it is getting cooler, unfortunately this is not always the case. If you notice pests in your grass or in your trees, be sure to apply a pesticide before these critters have a chance to do damage to your lawn. Knowing what you need to do when will be extremely helpful to you this fall. Keep a calendar of when certain tasks need to occur and when others have been completed. This will ensure that you can check everything off your list before mid November. If this all sounds like far too much work to complete on your own, we completely understand. Don’t worry, that’s what we’re here for. 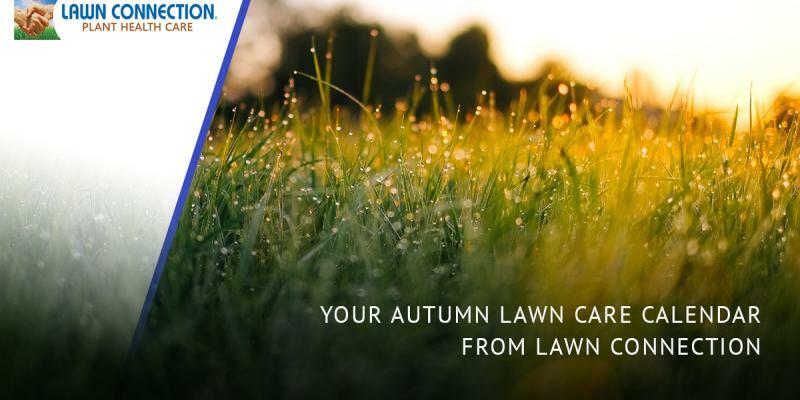 The professional lawn care team at Lawn Connection can complete all of your fall lawn maintenance so that you don’t have to. Simply call us today and find out how we can assist you in the coming months. You will be beyond thrilled with what we can accomplish as well as with what your lawn looks like when spring rolls around in 2018.